The build up to the end is impossible to see. Optimus Prime has to make some tough choices regarding Cybertron’s human prisoners. He has to make these choices fast as Joe Colton and his team are approaching the planet core. The book is titled First Strike so it can’t be the just the first, but a beginning to much bigger plot. Since there are only small uses of each Hasbro characters, I want to think that Colton’s aspirations are more than meets the eye. There are some other characters I haven’t seen in the series like: Rom the Space Knight or the Micronauts. Max Dunbar’s art is still spot on and very entertaining to read. 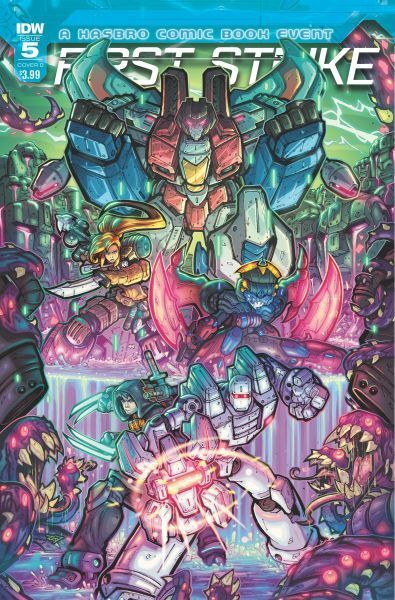 There are many other sub-plot stories to add to this story that will give us more information so IDW hasn’t missed out on the tie-in titles to back up the book’s story line. The ending will lead up to the series end in issue #6. It’ll be interesting to see how they resolve the story or who lives or dies when it all comes down.